Delia Metcalfe stock a fantastic selection of the marvellous Marco Tozzi footwear in a variety of styles including boots, slip ons, wedges and sandals. Savour the sunshine season with high quality Marco Tozzi shoes and sandals! We offer a range of summery sandals to match your personal style in a tantalising spectrum of colour from party pinks to gorgeous greys. The low heel court shoe in Dune is refreshingly neutral and understated and will go with many colours and dresses. 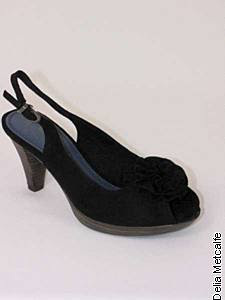 A great buy for an all-round classic shoe, comfortable with a generous size and width, yet pretty and feminine. 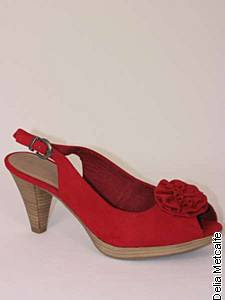 For a beautiful floral shoe, take a look at the rose red peep toe sling backs with flower detail. Choose the wide strap dolly style shoes in black or chili for comfort and cuteness or the leather peep toe summer shoe in black or taupe if you prefer to get your heels on! The wedge heel pump is the ideal holiday shoe, versatile and comfortable yet colourful, and made from imitation suede, this shoe is good looking and functional, a great holiday buy! Stylish, fashionable yet affordable, Marco Tozzi shoes come out on top for budget friendly shoe shopping. Buy yours today from Delia Metcalfe online!